Wondering what to do on a Monday night? Why not come along to our weekly pub quiz and compete for some cash prices? Every Monday from 9pm! Come down with your friends or join one of our teams right here in the pub. But make sure to come in early, we sometimes have up to sixty people playing. Yes that’s how much fun our pub quiz is! 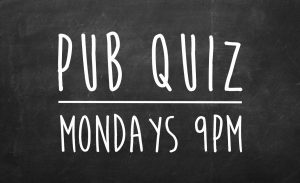 So join in, enjoy a pint and test your knowledge!